Carter Sickles in his SE Portland home. Photo by Nicolle Clemetson, for OutCity. It’s been a busy year for Portland author Carter Sickels, who in January 2012 came out with his acclaimed first novel, The Evening Hour (Bloomsbury), just as he began coming out as a trans gay man. 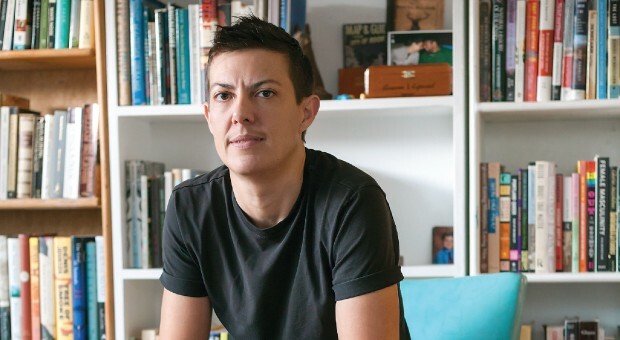 Since then, the 39-year-old Ohio native has published a short story, “Saving,” in the recently released anthology of trans fiction The Collection, and has begun work on a new novel, all while teaching fiction online for New York City’s Gotham Writers’ Workshop. Sickels has still found time to immerse himself in nature and strengthen the connection to the environment that features so prominently in his writing. We recently caught up with him at his favorite coffeehouse, Palio Dessert & Espresso House, in the heart of Southeast Portland’s leafy Ladd’s Addition. OC: Can you tell me about the new novel you’re working on? CS: It takes place in rural Ohio, in the ’80s, and it’s about a guy who left home and moved to New York and then comes back—he’s HIV-positive—to save his family and reconcile with them. So it’s very much in that time of AIDS culture when people were … when it was like this hysteria, and incredibly awful, terrible things were being said. It’s been really interesting doing the research for it. It’s hard, too. It’s this huge part of our history and culture that, because I was in my teens and early 20s when it was happening, I have no connection to because I wasn’t out and wasn’t identifying as queer. OC: How do you feel about being identified as a trans writer? CS: I didn’t want it to become an issue, like, “Oh, I don’t want that label.” I just sort of said it in one interview. … I’m happy to be out as a trans person. I didn’t feel like there was ever a risk for me to be pigeonholed, because my book doesn’t have a trans character; it didn’t get marketed in any way like that. Also, I wrote The Evening Hour before I was really identifying as trans. OC: Did your feelings on the issue shift with the publication of “Saving”? CS: I started writing that story before I found out about The Collection. It’s one I started and stopped and rewrote many, many times. So when I found out about this call for submissions, it was great because I felt like I had a place. They wanted to put together a book with trans protagonists, and I don’t know who will read it—probably mostly queer people—but they were looking for fiction because usually when you do read trans stories, it’s memoir. So I think it’s really great. And it’s been good for me to sort of come out with The Evening Hour, and then come out with the short story, having a bigger, more general audience and then a more queer audience where I can talk about being trans and how it relates to the story. OC: Your works so far all take place in Appalachia. What is it about the region that appeals to you? CS: I think part of it is just having a lot of childhood memories. I grew up with the same sort of conservative attitudes, but my area was a little bit different—I was in central Ohio, so I was closer to Columbus. There’s just something about Appalachia—it has this sort of old-timey feeling to it, and despite all the sorts of terrible things you can experience there, it’s really beautiful. People seem connected to the land. OC: Speaking of connection to the land, what are some of your favorite parts of the Pacific Northwest? CS: It’s all so beautiful here. There are parts of the East Coast that I love and are beautiful in other ways. Here, it’s just so different. It’s huge, picturesque, like postcard beauty that doesn’t really feel real sometimes. My boyfriend Jose and I recently went to Goat Rocks, which is my favorite so far, in Gifford Pinchot Forest in Washington. We went in August, and it was wildflower season—just incredible fields upon fields of wildflowers, and then snow-covered mountains and glaciers. It was gorgeous. I’ve gone backpacking out here a few times, which had been something I’d always wanted to do. I love how that’s a part of the culture here—everyone has a tent and a sleeping bag. I love Portland—it has sort of a small-town feel to me, but it’s rich in writers and art and music. I feel like I’m just now connecting to the writing community—Portland has a ton of talented writers. Tom Spanbauer, Lidia Yuknavitch, Alexis Smith, Pauls Toutonghi, Cheryl Strayed, and so many others. Tin House is here, too, which publishes great writing. Find more about The Evening Hour and Sickels’s other writing at cartersickels.com.